Powers/Abilities: None. She was very smart, had great rhetorical skills and knew how to negotiate. (Marvel Comics Presents I#107/2 (fb) - BTS) - The American Blackfoot of Alberta/Montana Blackfoot Reservation worked together with Roxxon to complete an oil pipeline routed through the reservation, but the Canadian Blackfoot didn't want this to happen. A meeting between all parties was arranged at the reservations high school to discuss this issue. (Marvel Comics Presents I#107/2) - Melissa and the whole reservation's tribal council met with two Roxxon spokesmen in the Blackfoot Reservation High School to discuss their offer. 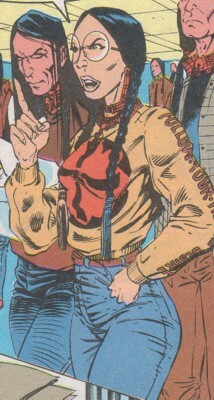 Melissa explained that the Blackfoot on the American side didn't want to work together with Roxxon because of their capitalistic ways and questionable environmental record. She told them that their proposal was quite a joke full of lies and marketing double-talk. While she continued her talk a sniper hired by Roxxon tried to shoot Melissa, but Red Wolf stopped the sniper and threw her through the skylight window onto the meeting table in the Reservation High School . The meeting was stopped after Red Wolf told Melissa and her partners about Roxxon's schemes behind their backs. Comments: Created by Fabian Nicieza, James Blackburn, Jonathan Holdredge & Chris Ivy. The exact location of the reservation is hard to depict because there is not much info given in the story. It could be in Alberta or in Saskatchewan, Canada. It would've been easier if I knew which Blackfoot were Melissa's tribe (Kainah, Blood or Piegan), but this info was left out too and so I'm stuck with imprecise description from above. A group of mercenaries (at least six members) were hired by Roxxon to further their negotiations with the Blackfoot by stirring up trouble between both sides of the reservation. They posed as Canadian Blackfoot who were against the pipeline and tried to bomb it. 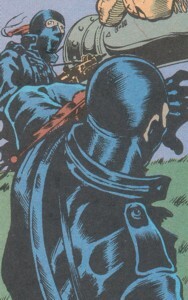 Red Wolf stopped them and unmasked one mercenary to learn of Roxxon's plan. Meanwhile another mercenary waited on a water tower near the Reservation to kill Melissa Sparrow Hawk. Red Wolf stopped her too with an arrow through her hand and threw her into the meeting after he had unmasked her as well.